A new report has revealed that massive fractures in the ice shelves of West Antarctica are threatening to increase the rate at which they are melting. The study, which has looked at 40 years of satellite images of the West Antarctic ice shelves, states that the region has seen an increase in ice loss over the past few decades. Over the past 30 years, due to the region growing steadily warmer, the Antarctic Peninsula has been repeatedly named as one of the fastest warming spots on the planet. The facts and figures for the melting of the West Antarctic Ice Sheet are staggering. First of all, the region is about the size of Greenland and contains about 10 percent of all the ice in Antarctica. If the area continues to melt and break off into the sea, the impact on global sea levels will be enormous. Currently, the glaciers that make up the ice sheet slowly flow toward the sea. Once there, the ice floats atop the ocean, forming what is called an ice shelf. The glacial flow is resisted naturally by the bay’s rocky walls and seams where the glaciers merge. This creates a doorstop effect as the glaciers attach themselves to the rocky outcrops. However satellite images shows that in the eastern Amundsen Sea Embayment, the ice that normally grips onto the rocky walls is fracturing and retreating inland. As the fracturing increases, new icebergs split off and drift out to sea. While this process is normal, it is occurring more rapidly due to the increasing frequency of cracks. As an ice shelf’s grip continues to loosen, these already-thinning masses of ice will be even less able to perform their doorstop function of holding back the grounded ice upstream, potentially leading to even faster flow of these already speedy glaciers. The team’s research is detailed online in the Journal of Glaciology where it would seem that if nothing is done to halt the warming, the ice shelves are poised to disappear faster than we ever anticipated. 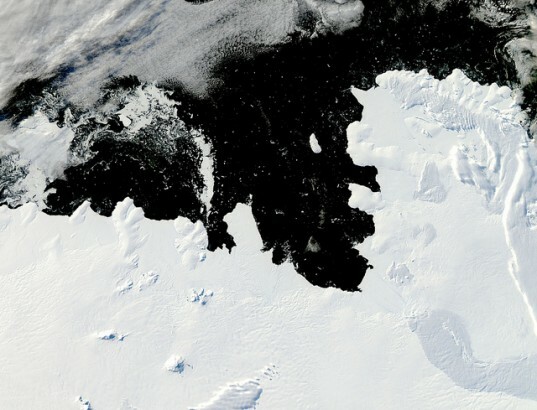 NASA image acquired March 14, 2010 Pine Island Bay is tucked into a corner of the West Antarcticâs Walgreen Coast. The bay, which opens to the Amundsen Sea, is typically filled with sea ice at this time of year, but when the Moderate Resolution Imaging Spectroradiometer (MODIS) on NASAâs Aqua satellite passed overhead on March 14, 2010, the bay was largely ice-free. 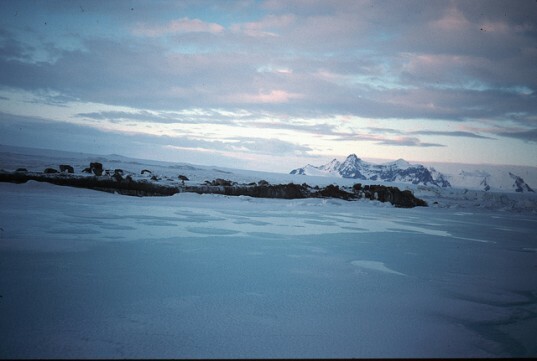 Acquired at the end of the Antarctic summer, the image is illuminated by fairly low-angled sunlight, which highlights raised and textured areas, including ice-covered peninsulas and the corrugated surface of iceberg B-22A. B-22A broke from the Mertz Glacier Tongue several thousand miles to the west; it may be grounded on a submarine shoal. Northwest of the iceberg is a combination of sea ice and grounded icebergs. This sea ice/iceberg feature has been larger in recent Antarctic summers than it appears in this image. The coast of Antarctica not only has sea ice that comes and goes from year to year, but also longer-lasting ice shelves (thick slabs of ice attached to the coastline that partially float on the ocean surface). Among the ice shelves on the Walgreen Coast is Dotson Ice Shelf. Although most of the surface appears smooth, several long cracks appear to trace the leading edge of the shelf, hinting that the margin may calve some long, narrow icebergs in coming summers. The presence or absence of sea ice affects both ocean surface waters and ice shelves. Thanks to its light color, sea ice reflects much of the Sunâs energy back into space, keeping underlying ocean waters cool. Without a cover of sea ice, the surface waters of the ocean warm. The exposure to sunlight also makes it possible for phytoplankton to bloom. West of the line of grounded icebergs, the ice floating in the Amundsen Sea takes on a greenish color; this may be due to phytoplankton or algae. When it comes to ice shelves, a sea-ice cap on the ocean surface dampens wave energy that might otherwise trigger ice-shelf retreat. NASA image courtesy Jeff Schmaltz, MODIS Rapid Response Team at NASA GSFC. Caption by Michon Scott and Rebecca Lindsey, based on image interpretation by Ted Scambos, National Snow and Ice Data Center. Instrument:Â Aqua - MODIS To learn more about this image go to: http://earthobservatory.nasa.gov/IOTD/view.php?id=43499 NASA Goddard Space Flight Center is home to the nation's largest organization of combined scientists, engineers and technologists that build spacecraft, instruments and new technology to study the Earth, the sun, our solar system, and the universe.